ESPN may be boosting its emphasis on baseball. It looks like ESPN is set for a course reversal on baseball studio coverage. Back in April 2017, around one wave of massive talent layoffs, they cut the once-daily Baseball Tonight into a Sundays-only show. They then changed their daily baseball-specific coverage to just a syndicated version of MLB Network’s Intentional Talk, airing Mondays to Fridays on ESPN2. But Awful Announcing has learned that ESPN is planning to bring back a daily in-house show (possibly under the Baseball Tonight branding, possibly not), and that ESPN president Jimmy Pitaro has described getting a full playoff series (as opposed to the current wild-card game they have rights to) as a ‘priority’ for the network. 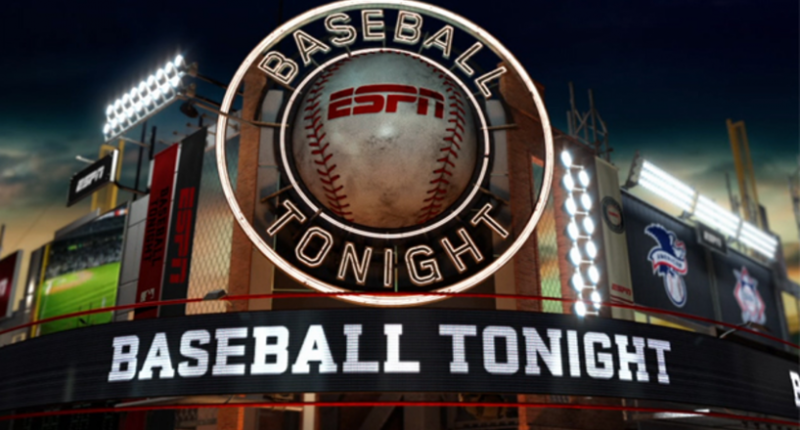 …The new “Baseball Tonight,” or whatever the name ends up being, may not just take “Intentional Talk’s” time slot. It could run later in the evening as more of a reaction show and could be housed on ESPN2 or ESPN’s subscription service, ESPN+. It wouldn’t all be new hires, either. As Marchand notes, previous Baseball Tonight hosts Karl Ravech and Adnan Virk are still at ESPN, as are analysts Mark Teixeira, Eduardo Perez, and David Ross and insiders Buster Olney, Tim Kurkjian, and Pedro Gomez. While there were some cuts to ESPN’s baseball staff in those April 2017 layoffs, they still have a lot of people covering the sport on TV (both with game broadcasts and hits on shows like SportsCenter and Get Up), podcasts (where Baseball Tonight is still a significant brand) and online. Bringing back a Monday-Friday baseball show would require more work from some of those people, perhaps some schedule/emphasis juggling, and perhaps some further hires (either for the new show or for those personalities’ current duties), but ESPN definitely isn’t starting from scratch here. This is an interesting change of approach from ESPN after less than two years, but there are some understandable reasons for the shift. One is a change in ESPN leadership; Pitaro is known to be a big baseball fan (he even mentioned his love of the Yankees in his introduction to ESPN employees), while Skipper was known for his emphasis on the NBA. But there’s presumably more to it than that; you don’t get to run a giant sports network (or, at least, don’t stay running a giant sports network for long) if you only program what you want to watch. And there are two perhaps compelling business arguments for ESPN to make this move. The first involves ESPN+, which makes the ESPN content situation very different than it was in April 2017 (when that over-the-top service was planned, but still a year away from launch). A previous challenge with ESPN having an evening baseball show daily came from their other event programming commitments, especially in April (when they still have a massive tonnage of NBA regular season and playoff games) and September (when they have a lot of midweek NCAA football games). And while they had the option of pushing things digital-only on ESPN3 in the pre-ESPN+ days, that wasn’t a spot where they wanted to invest in content, as it wasn’t producing extra revenue (ESPN3 was, and still is, available at no extra charge to those with authenticated cable or satellite subscriptions to ESPN). So that might add further incentive for ESPN to bring back a regular baseball show of their own. And in an ESPN+ world, they have some more programming flexibility, so it’s probably easier for them to do so. We’ll see how this all plays out, but there’s certainly an intriguing case for ESPN to get back into the baseball studio show game in a bigger way.